The African grey parrot is a highly intelligent, highly sensitive bird that is uncomfortable with sudden change. He is also highly social, spending nearly 24 hours a day with his mate or flock in the wild. The bonding process may be slow and suffer setbacks, but with caution and proper care your African grey will slowly learn to value, and even need, your company. 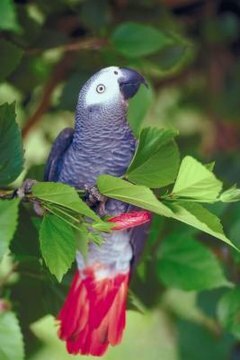 The first step to bonding with your African grey, whether he's young and friendly or a little more mature and standoffish, is understanding his body language and recognizing his boundaries. Your bird may be frightened or angry if he growls, flattens his feathers or quivers. These are signs that whatever you are doing is upsetting him, and may provoke him to bite if you continue. A bird who grinds his beak, stretches his neck and regurgitates, preens his feathers, bows his head to be scratched or stands on one foot, on the other hand, is feeling content and relaxed. Eye pinning, when the pupil expands and contracts rapidly, is a sign of an emotional state: either curiosity and excitement, usually when his body is relaxed, or distrust and anger, usually accompanied by puffed up feathers and narrowed eyes. Give the bird some space when he shows signs of fear or agitation to help build a trusting relationship. Avoid pushing the bird to bite to make his point, since this will encourage more biting in the future. In the wild, greys forage on the ground as well as in the trees, a practice that exposes them to predators. As such, they have developed a cautious and sometimes fearful nature. The more you socialize your grey, the more well-adjusted he will become. Include him in your activities throughout the day, keep his cage in a room that sees plenty of family activity, and gently introduce him to new people and situations frequently. This will help him bond with multiple family members and be polite and calm around strangers. Training your grey is a great way to build trust and establish boundaries and rules in your relationship. Keep your training sessions short, 10 to 15 minutes at a time, and positive. Greys get bored easily and can be frightened and put off by negative reinforcement. Reward good behavior consistently and try to ignore bad behavior. Never chase or run towards your grey in training or at any other time, as this is seen as a predatory move. It will make the bird fearful of you and will reverse the progress you have made in your relationship. A young grey will usually have a friendly nature and bond relatively quickly. Older birds often need more time and patience to establish a bond, but with time, attention and respect, it will happen. Try to spend as much time as possible both interacting with your bird and being near him during your usual routine. Eventually your grey's need to socialize will win out and he will start coming out of his shell.